'Just My Luck' ( Anna and David Cadd, R. 2003). Seedling 62-92-1. BB, 27" (68 cm), Midseason bloom. Standards and style arms old gold, midrib flushed burgundy; falls yellowish ground with deep reddish burgundy wash, 1/4" deep burgundy plicata border, burgundy plicata shoulder markings; beards yellow, bronze tip; ruffled; slight sweet fragrance. 'Shenanigan' X 'Tennison Ridge'. Cadd 2003. From AIS Bulletin #329 April 2003 Introducing JUST MY LUCK: (Cadds 2003). BB. 26"-28" (66-71 em.). ML. S. Old gold with midrib flushed burgundy; styles same. F. Yellowish ground with deep reddish burgundy wash and ?" deep burgundy plicata border. Yellow beards, tipped bronze. Elegant and ruffled with 7 buds. Shenanigan x Tennison Ridge. Sdlg: 62-92-1. $15.00. 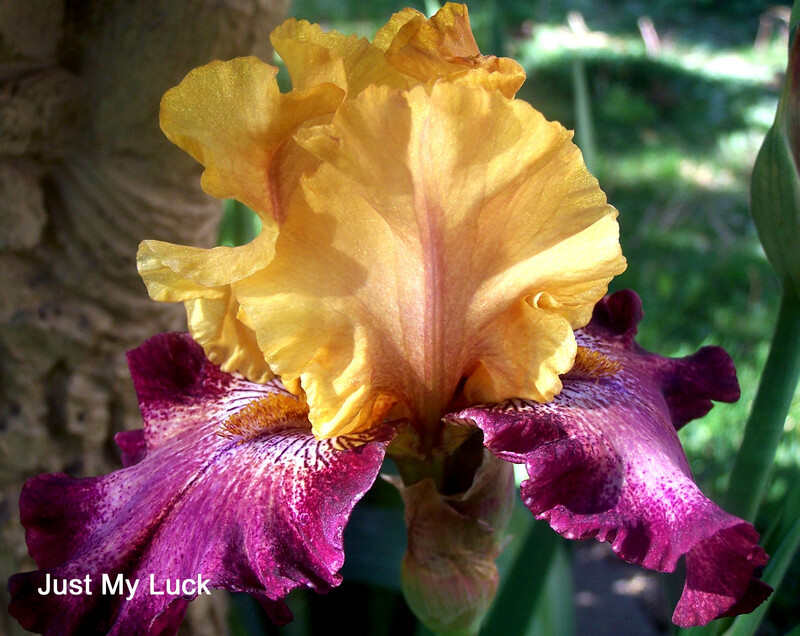 Cadd's Beehive Iris Garden.